It’s easy to trick people to click, like and share the dumbest things on social networks. I have blogged about this topic before, for example regarding how to spot a fake giveaway on Facebook. But I can’t stop being amazed at the number of people who are fooled by these easy hoaxes time and time again. Here’s a fresh example. 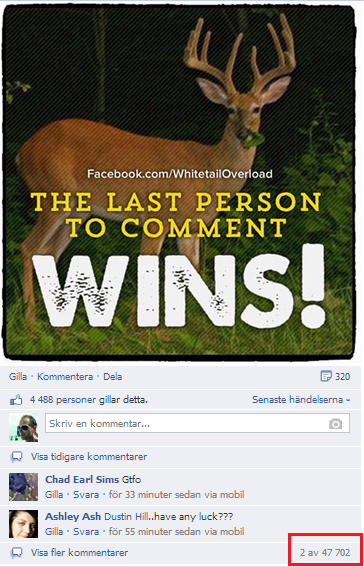 Whitetail Overload is a Facebook page dedicated to the “pursuit of the Whitetail deer”, and it has half a million followers and a PTA (people talking about) of more than 1.3 million. How do they get that much engagement? They post often, entertaining and they trick users into interacting with the content in the most deceiving ways. Take this post for example, it uses and old trick, asking users to guess what happens when they click like on the post. Of course, absolutely nothing at all happens. 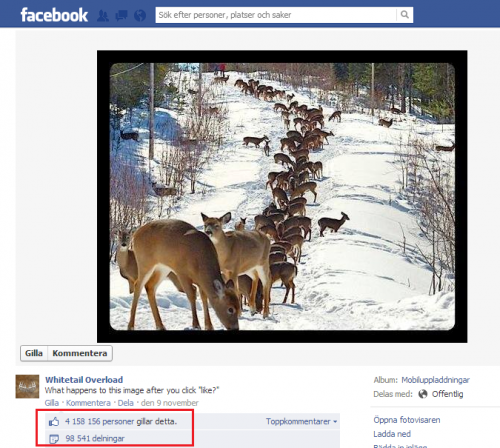 But look at the numbers, 4.1 million people have liked the post and almost 100,000 have shared it. Incredible. Here’s another one, and I must admit that this is as brilliant as it is evil. The last person to comment on the post wins a t-shirt. And of course, the comments never stop coming. As of now, there are 47,000. For a t-shirt! As long as people are this naive, don’t be surprised when your social networks are filled with spam and scams.